Electric utilities in the Southwest expanded their energy efficiency programs over the past decade, except for a few bumps in the road (see chart). In 2017, all of the major utilities in the region were at or above the national average savings percentage for larger utilities which is approximately 0.9 percent of retail electricity sales according to ACEEE. The leading utilities, Arizona Public Service Co. (APS) and the Salt River Project (SRP), achieved savings equal to 1.5 to 2.0 percent of their electricity sales—as a result of 2017 programs alone. Recent developments in the region bode well for future energy efficiency efforts, at least for the main utilities in Colorado and Nevada, Xcel Energy and NV Energy. On the other hand, there could be a significant reversal with respect to the energy efficiency programs run by APS. In Colorado, the Public Utilities Commission (PUC) recently approved an energy savings goal of 500 GWh per year for Xcel Energy during 2019-23, equal to about 1.6 percent of Xcel’s projected retail sales during this period. The new energy savings goal is 25 percent higher than the goal in effect during 2015-18. In addition, the PUC strengthened the performance incentive mechanism that rewards Xcel Energy for meeting or exceeding the energy savings goals, supported geo-targeted demand-side management (DSM) efforts on constrained distribution system feeders, and increased the non-energy benefits adders used in DSM program cost effectiveness analysis. The written order in this proceeding was just issued by the PUC and an appeal process is getting underway, with the shareholder incentive mechanism expected to be the main issue questioned during appeal. The higher energy savings goal, which was originally proposed by SWEEP, is not likely to be challenged or modified. Once the docket is closed, Xcel Energy will submit its 2019-20 DSM plan for PUC approval. This filing is expected by the end of the summer. In Nevada, NV Energy recently filed a new three-year DSM plan in conjunction with a new Integrated Resource Plan. The DSM plan calls for the utility to spend $197 million on electric DSM programs during 2019-21, approximately 30 percent more than the utility spent during 2015-17. The plan is designed to save approximately 345 million kilowatt-hours and reduce peak demand by 74 megawatts from energy efficiency and other DSM programs implemented annually during 2019-21. 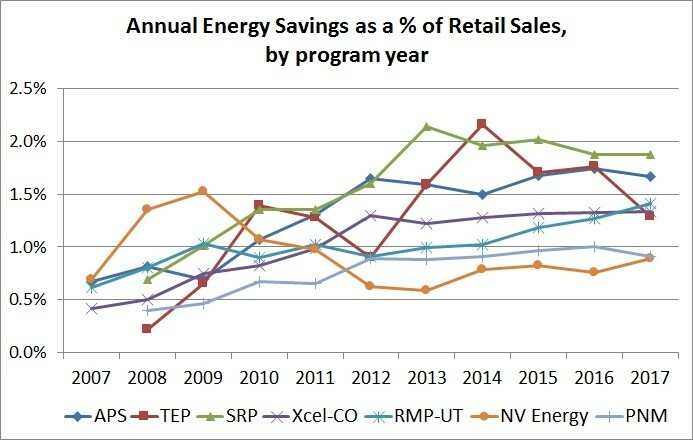 The annual energy savings target is equivalent to nearly 1.15 percent of NV Energy’s retail electricity sales. This is significant step up from savings levels achieved by the utility in recent years (see chart above). Energy’s new DSM plan responds to energy efficiency legislation adopted in Nevada in 2017, as well as new PUCN rules which are still in the draft phase. SWEEP will participate in the DSM plan docket and strive for even higher energy savings levels than those proposed by NV Energy. Now for the bad news. In Arizona, APS has proposed deep cuts in its energy efficiency programs including eliminating residential and commercial and industrial (C&I) lighting programs, C&I refrigeration measures, and air conditioning efficiency programs starting in 2018. APS argues that energy savings during daytime hours in the spring and fall are no longer as valuable to the utility as in the past, given the growing penetration of solar resources. At the same time, APS has proposed adding over 5,000 MW of new gas-fired generating resources during 2018-32, a proposal that SWEEP criticized and the Arizona Corporation Commission (ACC) rejected. SWEEP strongly opposes APS’s DSM cuts, arguing that the programs continue to provide value to the utility system most of the time, and that APS has failed to demonstrate that the programs are no longer cost effective. Moreover, eliminating many energy saving programs would put compliance with the ACC’s energy efficiency standards at risk. In addition, contractors have weighed in at the ACC opposing the program cuts. The ACC is expected to rule on APS’s proposed 2018 DSM plan later this summer. In summary, two major electric utilities in the Southwest will significantly expand their energy efficiency programs in the next few years. Unfortunately, APS is proposing to go in the opposite direction, but the utility’s proposal to eliminate a number of cost-effective and popular efficiency programs is by no means a “done deal” yet.